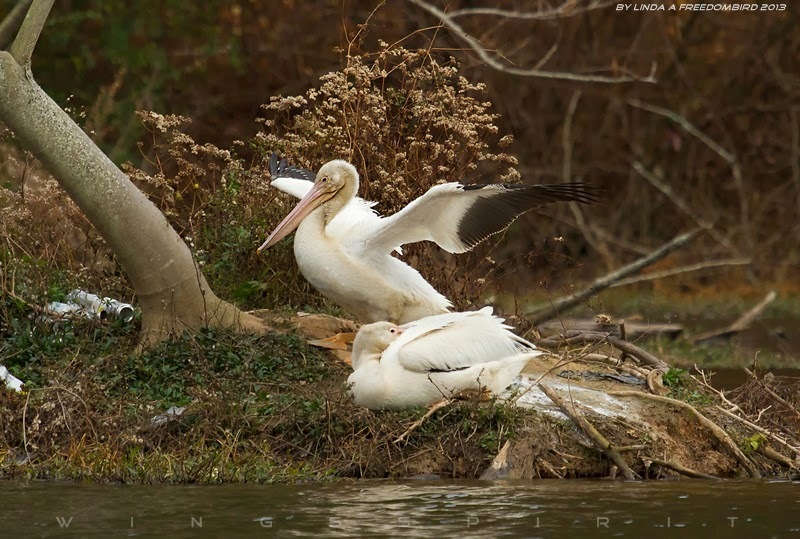 Two American White Pelicans ( Pelecanus erythrorhynchos) were reported to be seen on and off at Murphey Candler Park last week. I have seen White Pelicans many times during my coastal trip and my recent trips to San Francisco, California. But this is first time for me to see them in the Piedmont region of Georgia. 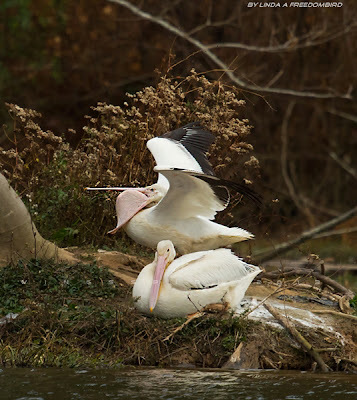 Things really got me so interested in is why these two White Pelicans chose to stay at an intown lake? Breed in isolated islands of northern states and in central Canada, American White Pelicans migrate through central and western of the states and winter mainly in Southern California, Florida southern Texas and New Orleans and in Mexico. They are the second largest birds just a bit of smaller than the largest bird American Condor, with a wingspan about 10 feet (or 3 meters) and weigh over 20 lbs (or 9 Kgs)! A birder I met during my photo shoot, told me unlike Brown Pelican plunges into water to hunt, American White Pelicans forage by using their huge, pointed beak spear through their prey while swimming in shallow water. It's amazing to know these graceful birds systematically search for fish when paddling! An adult can eat over 4 lbs fish a day! Unfortunately I did not see them hunt for fish when I was there today. Not sure if you notice some trash in my second image. There are many beer cans left by some careless human, that really spoiled my photo :( The worst for me is to know that some people choose not to care or just completely ignore the fact that we should all work towards well being of all species on this planet. I believe everyone already know there is a way to reduce human waste by recycling plastic containers, paper and aluminum products. If you are reading this post, I am sure you DO CARE! Start recycling any thing that can be "taken" back and teach young adults and your friends of influence to the concept of "3-R" : recycle, reduce and reuse! To me, reduce and reuse are far more important then recycle. Because if we all "reduce" what we need in our daily living and "reuse" shopping bag or containers or completely ban using plastic bags in our country, we automatically will buy less and eventually create less waste of any kind and, ultimately do less harm and damage to our environment and wildlife.